Image from the Caller.com Times, article by Mike B. More on this story here! Can someone hey-splain to me what 'Bleen' means? I have no idea! It's like C.O.-speak for 'first'—but how did it come about? I OTTER be in pictures. *makes off with the snorgable otter* Mine! Joke one: "You.... want me to get in THAT? But it's gonna be cold!" Joke two: "Oh, hi there! I made you some ice for your party!" I love the little paw pointing at the ice. I just love otters, though. And it's hot out, so the ice is pretty appealing, too. Oh my god! How cute!! I LOVE the TX state aquarium!! Icy I otter check out this site more often! Dis my pool? Where's teh fish?!? No fish in der. No water in der. What am I supposed to do wif teh plain ice? No eets? No sweeminks?? "Mind if I take a dip in there?" 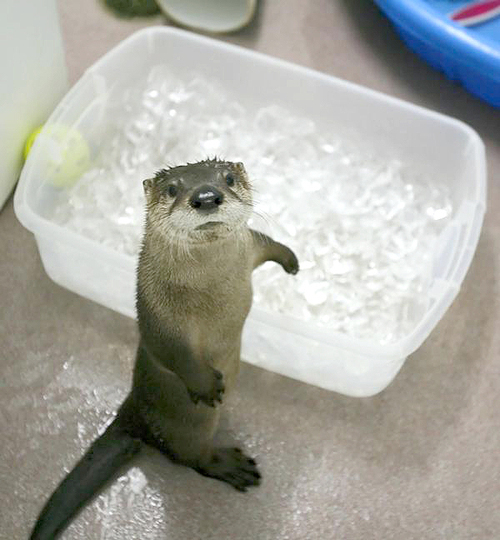 i otter tell ya...that water's a little cold! I otter get you good for making me squeal *squeal* with delight at seeing the otter. a cutie by any otter name would be just as cute. this many comments in and no one's made an otter pop (http://en.wikipedia.org/wiki/Otter_Pops) reference yet? I love this term from the article: "howdy era." I hope Odie and Gwynivere fall madly in otter love! don't drink it, who knows what he put in the drink!!! YM runs in, plants a kees on that superb nosicle and runs out again giggling. When someone asks about "bleen", why doesn't someone answer? Doesn't anyone know? Someone said it and we sheep follow along? Odie is so cute! I'm glad that family didn't just leave him there. I had a friend a long time ago who was "otterly" mad about otters. In fact, that expression looks sort of familiar... Marjie, did you finally manage to come back as an otter after all? dees not my natchural habeetat. i eees bebeh ottere, not bebeh pengwin!!!!! It´s Harry Otter and the Goblet of Ice! "Roight. What's dis den? Loik, who nicked de last can o lager? Foin." Oim an owtah, wiv a Bwitish accent, dontchano. Catherine--no apologies needed, I was just being sheepish! Tears in my eyes - he's too cute. Late July Ad Campaign: Getter 'otter? Call an otter! "And see, here is where they mixed up the drinkie-poos, but I thought I was s'posed to swim in thar! I stuck my paw in and it's REALLY cold, dewd!! So where am I s'posed ta' swim then, huh? *looks to the left, looks to the right, looks straight at camera* Otter-tini's? You want me to DRINK that stuff?? My Momma wouldn't-a-liked 'dis!" Shaken, not gyrated please. Please, I'm begging you, don't let a few martinis lead to the otter bump n grind. Odie, you are too cute! I am very glad you were rescued. Plus you can shake it better than most people I know! Allo, moi noim iz Hairy P. Otter, an' apparently, Oi am Hermione's Patronus! Isn't he too young to be mixing up the Ottertinis? Well, with that moist nosicle and those whiskers... go ahead! Catherine no one answered cause it was Meg the one and only. she was being funny. anyway Bleen is cause Theo our beloved moderator hates when you say first on the first post. so we all go bleen instead and if you say first he will change it to say bleen unless you make a very witty post incorporating the word first. of course this is difficult to do as you are trying to beat everyone else who is trying to be the first post. Snicker... and it makes for some way more interesting first posts.